Sunday night Matt and I had the pleasure of dining at Stephan Pyles in downtown Dallas and it was absolutely decadent. For those of you who have followed my posts I’m sure it doesn’t come as a huge surprise that Southwest and Mexican Cuisine are my absolute favs. So what better way to spend Valentine’s Day then with one of the founding fathers of Southwest Cuisine! We usually reserve either Valentine’s Day or our Anniversary to spend at an ultra swanky restaurant that we’ve always wanted to try. Stephan Pyles was definitely one of those places. I’ve been to quite a few 5 star steak houses and they have been absolutely delicious, but this was my first true culinary experience. The creativity in the food was so exceptional that I was literally left speechless. Now for the food! The bread service started us out on a very high note. The blue corn muffins with serrano chilis were out of this world. The flavors meshed together so well and the pop of the chili hit the back of the throat just right. The focaccia bread and poblano cornbread were equally amazing. Following the bread service was a palate cleanser of Sushi grade Tuna topped with blood orange and herbs…delicious! The meal for the evening was a four course set menu and we both started out with the signature Southwest Caesar Salad. The presentation consisted of pieces of romaine lettuce tossed in a spicy Caesar dressing and served with a side of jalapeno polenta croutons and a parmesan crisp. Amazing! For the second course Matt had the seared scallops and I had the INCREDIBLE Tamale Tart!!!! I can’t even begin to describe how divine this dish was. 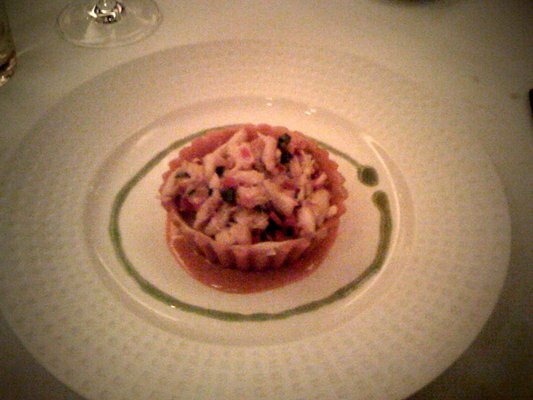 A tamale-like tart shell was filled with a roasted garlic custard, topped with diced peppers, cilantro, basil, and jumbo lump crabmeat. There were also two sauces spooned on the plate underneath the tart. I don’t know what was in it, but it was delicious! Matt and I both chose the Cilantro Crusted Hake for our entree. 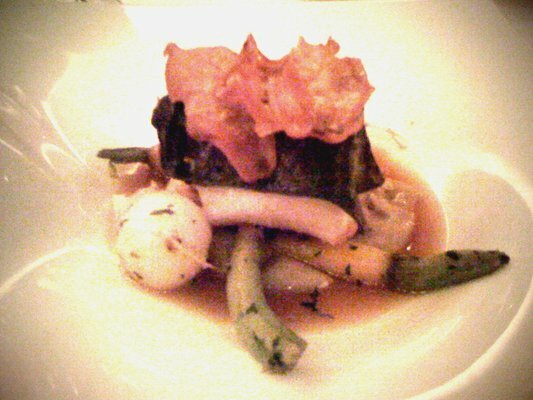 The dish was beautiful with a vegetable puree and broth serving as the base, layered with root vegetables, and topped with the perfectly cooked Hake and crispy sweet potato crisps. What I particularly loved was the cilantro crust. It was like a large, silky cilantro leaf perfectly placed on top of the fish. The fish was so perfectly cooked and flavorful. Needless to say Matt and I cleared both of our plates! To top of the evening we both had the Sabayon with praline ice cream and caramelized bananas. The Sabayon was pure heaven. 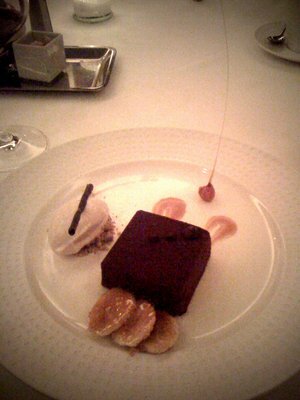 It was a silky piece of chocolatey, hazelnut perfection. Soooo good! The entire meal was so delicious and beautifully plated. The flavors in each and every bite were so rich and pleasing to the palate. The evening really was perfected when Chef Pyles stopped by our table to say hello and explain how he made the cilantro crust!!! I was definitely giddy! Matt and I had an amazing time and can’t wait to go back to Stephan Pyles. Go and treat yourself…you won’t be disappointed! Happy eating! Here are a few pictures of the food. Excuse the quality, they were taken with my phone! Nice article babe. Greatest meal I have ever had! 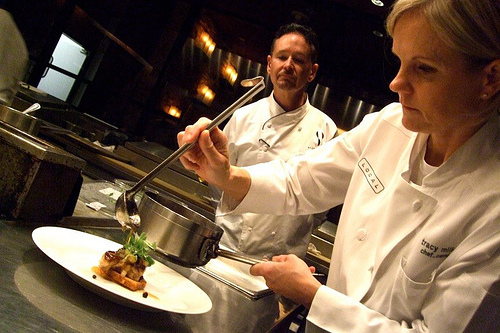 Great article, I haven’t been yet but would love to experience Stephan Pyles. As for Amy love it! Great pic and paring.